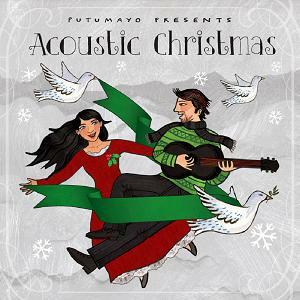 World music label Putumoya released ‘Acoustic Christmas’, a ten-song record which brings you back to the midst of the twentieth century. Ten tracks, all sung by renowned artists, will give you a jazzy Christmas feeling for at least half an hour. Singers like Mindy Smith, Stacy Kent, Emilie-Claire Barlow and She & Him are a welcome variation in the ages in which bands are fighting to perform the most poppyChristmas-song ever. ‘Acoustic Christmas’ keeps calm and in tune. Songs like “Let it snow! Let it snow! Let it snow!”, ‘Have yourself a merry little Christmas’ and Eartha Kitt’s ‘Santa Baby’ still stay close to original, but with a slightly new tune. The album evokes the spirit of fireside gatherings with family, singing carols and reminiscing about Christmases past. Some of the songs are newly penned; others are lesser-known interpretations of old standards. Whether enjoyed in a cozy log cabin or an urban apartment, these songs will provide merry accompaniment to every family’s Christmas celebration. Mindy Smith opens the collection with gossamer guitar rhythms and lilting vocals on her original tune, “It Really Is (A Wonderful Life).” The album takes a jazzy turn with The Sugar Thieves’ swinging take on Eartha Kitt’s sassy classic, “Santa Baby,” and Leon Redbone offers a twist of 1930’s New York jazz with “That Old Christmas Moon,” featuring his signature syncopated Harlem stride piano cuts. She & Him, a duo featuring actress/singer Zooey Deschanel, take us back to the fireside with their gently swaying rendition of “The Christmas Waltz,” before the tempo lifts again as the album moves into Emilie-Claire Barlow’s cheerfully bouncing interpretation of Christmas favorite, “Let It Snow! Let It Snow! Let It Snow!” Charles Brown adds a dash of West Coast blues to the mix with his smooth, saxophone-infused classic, “Please Come Home for Christmas,” followed by one of the most widely recorded Christmas standards of all time, “The Christmas Song,” sung by jazz singer Stacey Kent. With her take on “I’ll Be Home for Christmas,” Stephanie Davis evokes the universal holiday theme of going home for Christmas, if not in person, then at least in heart and spirit. Johnny Moore’s Three Blazers, led by Mari Jones, give the collection a taste of Christmas in the 1950s with their bluesy hit, “Merry Christmas Baby.” Finally, Hem brings the album to a close with “Have Yourself A Merry Little Christmas,” as Sally Ellyson’s gentle vocals shepherd listeners off to dreamland amidst images of mistletoe, shining stars and flying reindeer.